Book Direct for your next holiday! 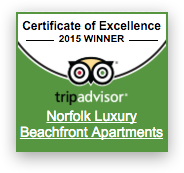 Escape for a seaside holiday to remember at Norfolk Luxury Beachfront Apartments, Main Beach. With a heated outdoor swimming pool, sauna and stunning location just steps from the beach, our 2 and 3 bedroom apartments set the scene for ultimate relaxation. Unwind in your extra spacious apartment, take in breathtaking sea views from your private balcony or enjoy a game or two on the full size tennis court. When you're in the mood to explore, world class attractions such as Sea World, Tedder Avenue and Surfers Paradise are less than 5 minutes away.